2150% ROI on One Single Domain Sale! Now let me start by saying I am in no way – shape or form – a “domainer”. Yes, I’ve bought several 5-figure domains in the past; however, what separates me from a domainer is that I buy my domains to grow websites and brands. Domainers or domain flippers will buy and sell domains to make money and earn a living. I first learnt all about the world of domaining when I joined the Namepros forum BACK IN 2009. It was when I was exploring different avenues of making money online, and a good friend back then showed me the site. As normal, I went in blind and tried to swim with the sharks, buying up a number of domains that I THOUGHT would be valuable, only to realise they’re actually worth pennies. In fact, I remember the day I purchased DavidBeckham.co.uk for $120 and thought I had my million-dollar ticket only to find out the very next day I couldn’t do anything with it due to copyright! I spent the next few months buying and selling a handful of domains, but I never made much. It just wasn’t for me! I retired from my domaining career after just two to three months and didn’t touch them for several years. That was until I stumbled across BrandBucket.com whilst looking for a brandable domain name for my new business. 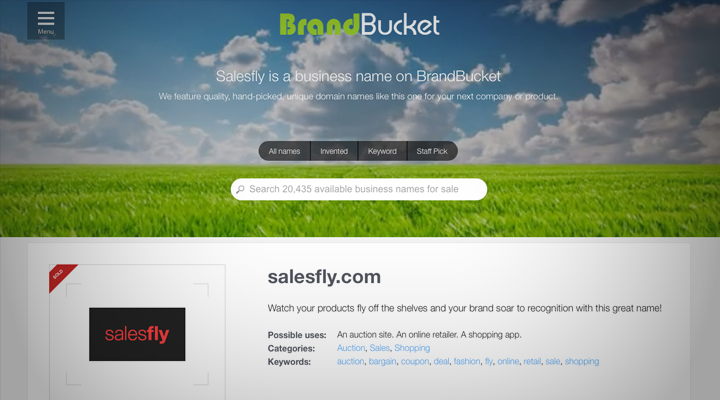 It was the early days of Brandbucket, and for those of you who’ve never heard of it, it’s a great domain marketplace whereby you can pick up highly brandable domains and logos of the latest ideas or projects. I’ve since spent thousands on domains and lots have come from Brandbucket. So, I’d found this place where people were paying 4-6 figures for domains that were short, catchy, and on brand. The entrepreneur in me instantly thought, “why not get on this early and get some domains listed”. What I did was, head to forums like Namepros and dnforum, Facebook domainer groups, and my general network of people, to advertise I was in the market for short, brandable .com’s! After a couple weeks of negotiations and back and forth, I was able to get myself a nice little portfolio of domains that fitted the Brandbucket criteria. The approval process was much more lax a couple of years ago, but they still denied some of my domains. Nevertheless, I still happened to get several of my domains listed on the platform. The outcome of this case study was that I managed to buy several domains for $100 – $500 and flip them for at least double the price. My biggest success story – and one I’m to this day still buzzing about – was that I managed to purchase Salesfly.com for $200. I couldn’t believe the seller sold it that cheap. I listed it on Brandbucket, and they valued it at $4500 (including their fee). Two weeks after I purchased it for $200, I sold the domain for the full asking price! I have many other smaller case studies similar to this one, but this is the one I’m most proud of. Here are some tips to help you do the same. You have to put yourself in the consumer’s position – what are they going to remember, what are they going to come back to, and what’s going to stick in their mind. I still believe .com is the only investment you should be making and it MUST be pronounceable. Although there are some obvious ones above, it’s the less obvious ones where you’ll find a bargain. This is due to people being more “clued up” on forums like dnforum and Buydomains.com. Therefore, you will find it harder to get a bargain on these sites. Your best bet is to head to Facebook groups or ask among your network. What you’ll find is people – who don’t do this for a living – are more eager to sell domains for cheaper. Hit up your network and ask them if they have any domains for sale! A little tip is that you can run domains by Brandbucket approval before you even purchase them to see if they’ll accept them, but I didn’t tell you that! Good luck and happy domaining!